I have a rule that I usually follow, and that is ‘Stay with the Cat’ or the kill, or whatever seems to be a relatively sure thing. Paraphrasing the adage ‘a cat in the lens is better than two in the bush’, leaving a given typically proves fruitless. Often, if I’m with photographers who are growing impatient while we’re waiting for a cat to begin a hunt, I’ll ask them what they’d like to shoot. Usually they’ll want a hunt or a kill, and I’ll reply by saying that’s what we have right here, but we have to wait to see if the hunt develops further. There’s little point in driving off and expecting to get something better when you have something promising on hand. But rules are made to be broken, even mine. 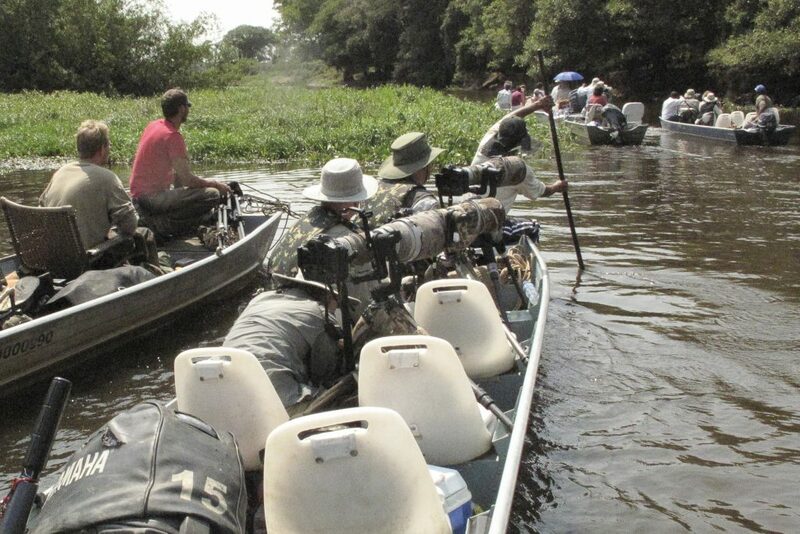 Last year, in Brazil’s Pantanal, we were a part of one of the not-uncommon ‘Jaguar jams’ as over twenty boats jockeyed for position as we followed a Jaguar working its way down stream. It is difficult to get into the right spot when you’re worried about not getting in the way of others who are also hoping to enjoy the cat. We would not be able to get as close as we’d like without compromising ourselves or others, and with the wakes of other boats rocking our small skiff, the shooting was difficult. So we broke my rule. We headed up one of the other rivers, figuring correctly that virtually all of the other boats would be congregated at ‘the sure thing’ and we’d have the river to ourselves. We traveled about 15 minutes upstream before we found another boat whose boatman gestured towards the shore, indicating that a Jaguar was nearby. With some difficulty we located the cat, lying in deep shade on an elevated bank overlooking a broad sandy beach. There was no photo. To our surprise, the other boat moved on. We did not, reasoning that we’d be pushing our luck passing up on yet another Jaguar. Instead, we motored over to a deadfall and tied in, giving us a great view of the beach if the Jaguar decided to hunt or drink. We waited. About ten minutes later the Jaguar climbed down from that bank, joining a second Jaguar we had not seen. The two seemed shy, and they spent the next twenty minutes or so peering over a rise in the sand, with only their eyes and ears visible. We stayed put, waiting. 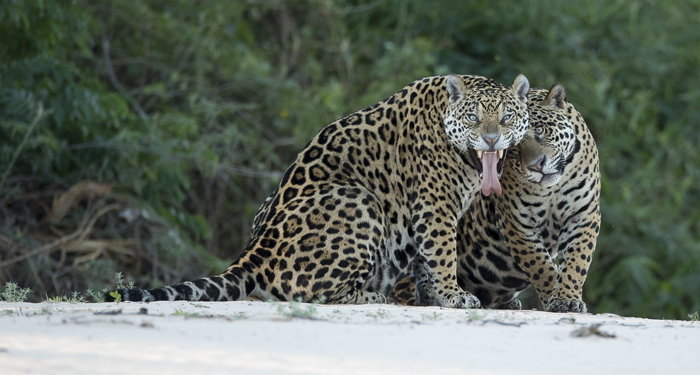 Finally, the two Jaguars decided that we were not a threat and they moved out into the open, where for the next half hour or so they lounged about or nuzzled each other or patrolled from one end of the beach to the other. We fired away, not believing our luck that we had two adult male Jaguars performing before us. Eventually both cats walked towards us before ducking into some stream-side vegetation close by, climbing the river bank, and disappearing into the forest. Breaking my rule paid off this time, but I wouldn’t recommend doing this without some thought. We had plenty of Jaguar photos under our belt and we could afford to take the chance. But as this experience proved, sometimes it is worth taking that chance! Joe McDonald and wife Mary Ann are world-class wildlife photographers. They offer the finest in small group wildlife and nature photography photo tours, workshops, and safaris, both domestic and foreign. Joe and Mary Ann will be a Keynote speaker at the upcoming NANPA conference, telling of their adventures in seeing all seven of the world’s big cats in a single year. You can see more of their website. Words and images ©2017 Joe McDonald. All rights reserved. Thanks for the story, Joe. Your risk paid off in spades.